Cloth nappies are gross! Aren’t they? A common word used by many a parent (and non parent) when they hear that a baby is wearing a cloth nappy – euwww! Is it often followed by a question or remark about poo. Some common ones include ‘you put poo in your washing machine? Gross’ and ‘yuck, I would hate to deal with the poo’. I am therefore making it my mission this week to dispel the ‘cloth nappy means more poo dealings’ myth. Have you ever had to deal with a ‘poonami’? You know, the one when no amount of baby wipes in the world would clean up the mess and you find yourself running with baby at arms length to rinse them under the shower! We have had a few of them. In fact the first time it happened Mr K ended up cutting baby boy’s vest off rather than deal with pulling it off him. I have to admit that I found it hilarious. The truth however is that baby boy was wearing a disposable nappy every time there was a ‘poonami’ incident. I can honestly say that I have never had to deal with one when he has been wearing a cloth nappy. The containment in my opinion is far superior and so straight away I would say that for this reason alone you are dealing with less and not more poo with cloth nappies. Now, when changing a disposable nappy the nappy is just rolled up, put in a bag and thrown away. A cloth nappy is obviously different in the fact that it needs to be washed. This is where I say (very loudly) that I do not just put the dirty nappy straight into my washing machine! I use liners in the nappies. When I change a nappy, the dirty liner is flushed down the toilet and the nappy is put in the bucket ready to be washed. See, no poo in the washing machine! Of course some gets in but it is a washing machine – it is designed to clean. I refer back to the ‘poonami’ incidents here. If your child’s clothes get a leak on them do you just throw them away or wash them? Most of us wash them of course which is exactly the same as washing the dirty nappies. There is no touching the nappies once they have gone into the bucket either. The bucket is lined with a mesh bag (no more wet pailing nowadays) and so when you are ready to put a nappy wash on you just take the bag out of the bucket and pop in straight into the machine. Simple! 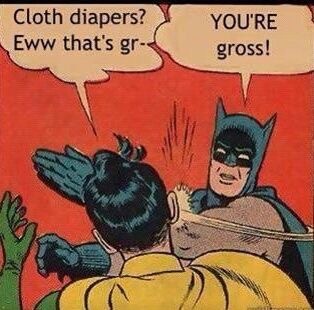 Cloth nappies are gross? Quite simply no! I could preach about disposable nappies sitting in a bin for 2 weeks but as many of you already know we do still use the odd disposable when the need arises and so that would be hypocritical. I do feel though that once you have seen cloth in action you could never think that cloth nappies are gross. A little bit of education goes a long way and if people knew how easy cloth nappies are maybe more people would give them a go. Have you noticed a difference between the reliability of cloth over disposable nappies? « Valentines Day – it’s growing on me! Conversely, with the cloth nappies I used, I didn’t have flushable liners. We had the little toilet-side attachment to flush down solid matter, and then we put the resultant nappies into the wash by themselves, generally on an extended soak cycle. I never found it ‘gross’, but it was a good deal more work than just using disposable diapers – although so much cheaper than the mountains of disposables you need. I have gone without the flushable liners before but for ease we use them most of the time now. If we don’t use them then Mr K is much more reluctant to deal with nappies! We have had this comment from so many people, in fact my husband was defending our decision in the pub on Friday (bless him). It is like people forget that children do still poo in disposables! Great post! I’m not sure my husband would defend cloth but he do think that he secretly likes them. We’re Yorkshire, he knows how much money we spent in preparation so need to be confident about it. Mr K has no idea how much I have spent on the nappies but my stash is mainly cheapies so it is actually not that much. Great post mum of 3 kiddiewinks. I agree with how addictive it is! My other half wasnt sure about them with our first but loves them with the current baby and happily bigs them up now 😀 But I agree, I hate the smell of disposables, I have no idea how anyone puts up with it full time! My K doesn’t dislike them he’s just not really interested in them. He’ll change them and use them but didn’t really see the need to buy them. He thought I was going all environmental on him. I did explain that it was only one of the factors and that there were plenty more just as justifiable reasons to use cloth. We adopted a 6 month old and were advised to not change too many things at once when he came to us. He was in disposables and we said we’d continue for a few weeks until he was settled and then start with cloth. He came to us with a course of antibiotics for a cough also, the resulting poonamis made us change to cloth on day 3 and we haven’t looked back! Those first few days I was washing complete changes of clothes 3-4 times a day. Now I wash my nappies one load a day ( could do it every other but I like doing them every morning). We also don’t use the liners but have a shower handset that is next to the loo so they get rinsed off first. I really thought my husband would play no part in this but he really doesn’t mind at all and is often trying to convert friends to cloth now! I may be sad but I love my cloth nappies, they look fantastic, they feel fantastic – so soft on his skin instead of yucky disposables but more importantly they perform better than disposables. Becs that is a great example of how Reusables can actually cut down on the washing! We have a 6 week old who started off in G nappies with disposable refills. They were better at containing meconium than the freebie pampers that I tried in the hospital. I wouldn’t have liked to try washing that stuff out, but when we moved on to breastfed poops they were just not being contained by the g nappies- the refills were scrunching up and the poop was going everywhere. Another couple of instances with emergency disposables was as bad. I had a starter stash of tots bots and we thought he was too small for them until we had to use them in an emergency when the amazon delivery of g nappy refills was late. I’m finding that since swapping to cloth for most of the time (I still use G nappies when we are going out so I can just chuck the insert away instead of carrying a big wet bag round with me) his poops are more contained, he has less nappy rash and we are having poop explosions on fewer clothes. I’m doing a wash a day- getting them dry is the hardest part to be honest. I was using fleece liners to begin with because the disposable liners weren’t containing breastfed poop, but we’ve more or less abandoned liners for now as we find they are more absorbent without. Maybe for bottle fed or solid weaned babies they are more necessary but I honestly have not got a problem putting them through the laundry on a 60 degree wash (which should kill any bacteria). I haven’t really noticed much in the way of smells except if he’s had a bit of a tummy ache and it’s all come out at once, at which point it’s probably on some clothes as well. Only had some slight staining from time to time which has usually come out on the next wash. It’s honestly not that hard to do all the washing and admin, and I feel so much better knowing he doesn’t have a load of chemicals next to his bum for hours on end. I think your family/friends’ support makes a massive difference- my mum is a bit of a wannabe eco warrior and my mother in law used terry cloth on my husband so they are both really on board and I honestly find cloth easier than disposables. I agree that the washing is not hard to keep on top of. Cloth nappies are just as easy as disposables once you have got a good routine going.